Wedding ceremony at Ananta Resort in Pushkar resort & spa tucked away in lap of Aravali mountain range offers a complete unwinding experience! Ananta resort is set in the midst of Aravali Mountains. The place is part of the chain of resorts in Rajasthan. Ananta Resort in Pushkar, is built in English architecture style has cottages as separate rooms with Aravali mountain range view. The place has star rated spa facilities, where guests can relax and rejuvenate to the core. Ananta Resort in Pushkar resort services takes your guests into complete relaxation mode, an ethereal experience for them & a calm state of mind which is so very much needed in today’s times. The place imbibes your guests with all the tranquil state through its architecture and natural surroundings ,hence you can be sure that wedding at Ananta resort in Pushkar will be a breezy one . Go for this place as your wedding venue, if the theme of your wedding is relaxing throughout and have good time. The place though set in Pushkar, has a different theme from typical royal and traditional look of weddings. The wedding theme could be any that you want, for traditional Rajasthani wedding theme at Ananta resort in Pushkar, a well researched and experienced way of decorating the entire venue has to executed by your wedding planner. 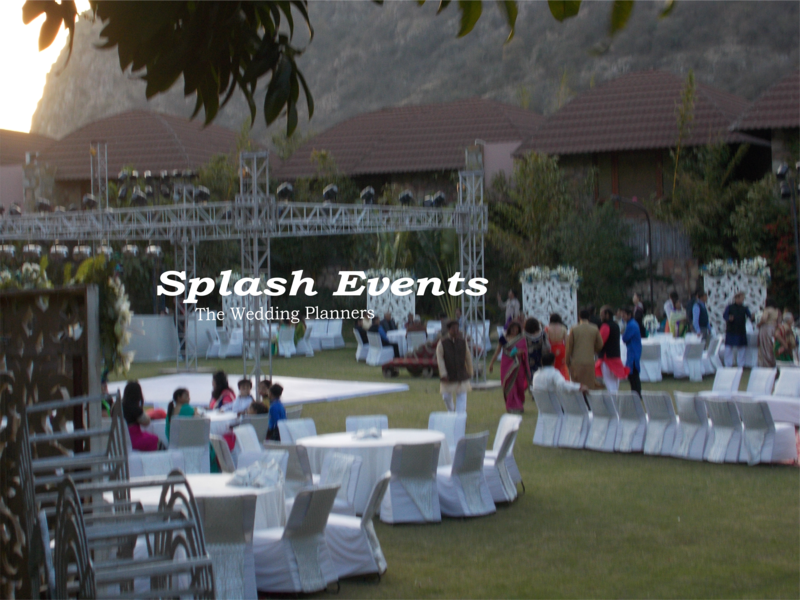 Splash events as wedding planners organized a wedding sangeet ceremony at Ananta resort inPushkar , and sangeet ceremony in the background of Aravali’s was extremely beautiful .Have a look at our few pics and you will really like the place ,keeping in view the natural ,English setting of this place. Relaxation and rejuvenation will be part of your wedding at Ananta resort inPushkar! Wedding in Clarks Amer Jaipur, which is the oldest and the first five star hotel of Jaipur, will remind you of the golden olden event parties of Jaipur! Clarks Amer Jaipur is the first five star hotel of Jaipur. It belongs to times when Jaipur was still a small town and all new, modern things were coming into place in the city. In hospitality sector, Jaipur witnessed Clarks Amer Jaipur as the first five hotel and it was a fresh breeze for people who wanted to have new places for outings. Jaipur started having big events at this new and first five star hotel. The other 5 star properties and 7 star properties followed, and were opened in the city and started getting equally popular. Clarks Amer Jaipur retains the charm for the people of Jaipur who are aware of the history of the city. The place gives you the option of organizing an ostentatious or a simple wedding both with its architecture which is a mix of –modern and old times. Clarks Amer Jaipur has all sizes venues and that also in good number, hence you have the option of picking up the venues, based on which you like the most. The space offered at these venues is also good. The lawns are also with good artistic background and very nice green. The convenience of the guests goes unsaid as the place is less than 2 Kms from the airport and same reasons the place is great benefit for logistics purposes when your event is getting planned. Go with your ideation and wedding planner and you can reap full benefits of this wedding venue in Jaipur. We love and respect our nation & hence are able to do the best happy weddings :-)! Situated in the centre of the city, Clarks Amer Jaipur will be a convenient option for you and your guests! Wedding in Taj Gateway Pushkar will be truly Taj! Wedding in Taj Gateway Pushkar will be a serene experience ,as pure breeze of worlds only Pushkar temple reinvigorate’s it every moment! Taj Gateway Pushkar is situated on the outskirts of Pushkar. Pushkar has world’s only Brahma Temple, hence you will find the place always buzzing with tourists, who come laden with spiritual spirit and almost exhume peace and positivity in the environment. Taj Gateway is also not untouched by the influence of Pushkar’s serenity. The foremost thing that attracted us or will attract anybody to this place is the ideal location of the hotel and Taj of course! :-)Once you enter the perfect mix of traditional and contemporary architecture will keep attracting you towards the interiors of this hotel. The lobby is almost welcoming you from all its corners with beautiful paintings, bright white, yes bright white colors, the rajasthani architecture and pristine surroundings. The excitement of entering the place and checking into hotel gets doubled up with the view of princely garden, huge pool- surrounded by Aravalis. The total number of rooms in this hotel are 80, so if you have a big family for your wedding this place is more than perfect. Almost all the rooms have Aravali mountains view, also the pool side view. Inside the rooms you will find big swing or jhoola,a private balcony, soothing interiors, comfortable king size beds, writing desk to bring your poet out, classy bathrooms and last but not the least yummy cookies. If you plan your wedding in Taj Gateway Pushkar, all you guests will be more than taken care of. Wedding venue ceremonies can be done in the garden and pool side view surrounded by Aravali’s .With these perfect surroundings,your wedding will look straight from the fairy tale books. White Chattri’s take you back to royal times! The winters are good time to visit this place but we found summers also no less a lovely time, if you plan to visit this property. You can enjoy the pool almost the whole day as it doesn’t gets very hot during the summers with mountains all around and the summer evenings are extremely pleasant of Rajasthan .In Taj Gateway Pushkar you will find very pleasant breeze during the evening time and the prayer bells of the temple of nearby villages will calm your entire being and will make you peaceful towards everything in life,almost. You will be treated specially by the staff. We were served with new mocktail during our each meal and it was great addition to the meal happiness. During our time to check out the place, we already were waiting to visit this place again.Basing on our experience, we found Taj Gateway Pushkar an ideal & comfortable destination wedding venue. Your wedding in Taj Gateway Pushkar will be all about class, comfort and cultural heritage. You will more than like it! Situated in the middle of Jaipur and a part of Late Her Highness Maharani Rajmata Gayatri Devi’s residence, Taj Rambagh SMS Function Centre will offer you palatial feel and hospitality both! Taj Rambagh SMS Function centre is more than ideal choice for couples wanting destination wedding in the heart of the Jaipur city. Taj SMS Rambagh Function centre is part of the palatial residence of Late Her Highness Rajmata Gayatri Devi, the part itself is huge enough for organizing a palace wedding here.Let us take you through our very own view of the place and also how we conceptualized and executed one of our client’s wedding on this venue. Venue’s aerial view before wedding decor preparations! There are around 20 rooms for the guests, pool side and an adjacent garden with the trees all around that you will be stunned with the beautiful surroundings. There is a huge garden with the capacity of 1500 guests. The garden has boundary of palatial walls and beautiful typical architecture chhatri’s all around. The lush green grass, the quiet surroundings and the peacocks all over will certainly take you to the princely era. Wedding Decor execution approved by the ideation team! The place is being managed by Taj group of hotels, hence you will find flawless services in all areas. We have simply more than loved their food and hygiene aspects and hence a special mention about these, here. Want a Cozy and Classy Destination Wedding in Jaipur, go with Chomu Palace as your destination wedding venue in Jaipur! Chomu Palace is situated on the outskirts of Jaipur and is approximately 30 kms from the main city. This palace recently, only few years back, has been converted into a Hotel. This place was residence of Jagirdar’s of Chomu and it was recently bought by one of the big hotel group of Jaipur. 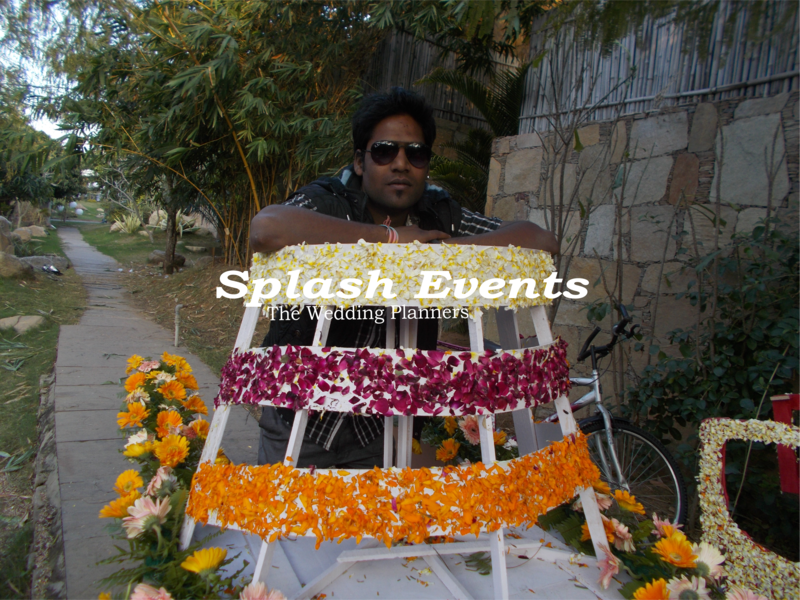 The place has become very popular amongst the destination wedding venues and also in Bollywood and Indian television shootings. Here we will take you through our experience of this place and also how we ideated and executed one of our client’s wedding on this venue. Chomu Palace is a small cosy palace with around 70 rooms, big garden, pool side and beautiful spacious corridors portraying the age old beauty of our ancestral heritage. With a big gate at the entrance and high walls surrounding it, the place looks like your own big house being traditionally guarded. You can imagine, as a wedding venue, Chomu palace will give lot of beautiful opportunities to be decorated. The perfect connectivity with the city also gives your wedding planner a great convenience with the logistics. Chomu Palace is a perfect option for destination wedding venue in Jaipur. Destination wedding in Chomu Palace according to your convenience can be made grand and humble as well without losing the touch of royalty. Here is a link to one of the wedding in Chomu Palace managed by us. 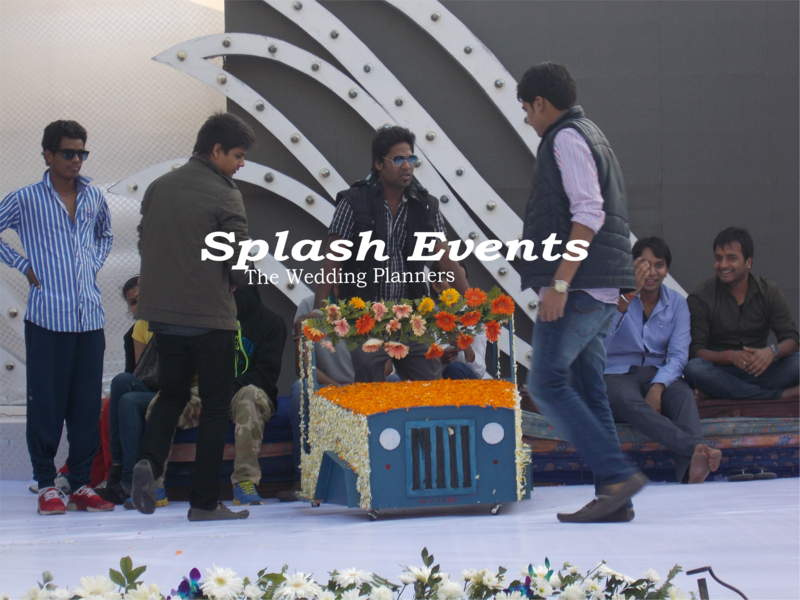 Here is the link to Wedding in Chomu Palace by Splash Events, The Wedding Planners in Jaipur. As wedding planners in Jaipur, we can give our word that Chomu Palace as destination wedding venue is one of the best and safest choice for your wedding in Jaipur.